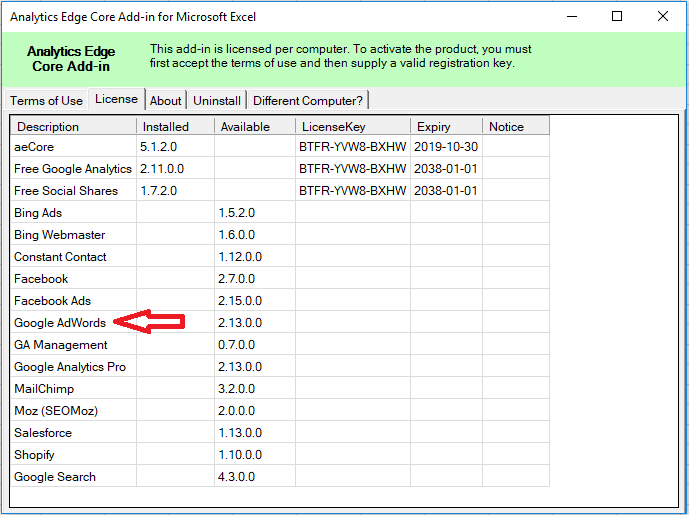 Welcome to the Analytics Edge Basic Add-in! Get ready for some simple Excel report automation. Just register the add-in, add an account, and start making your queries! Download and install the Basic Add-in from the Download page. Your license should automatically activate; if not, click the Register button. If you experience problems with the installer, see the Manual Installation guide. Select a cell for your query results. Select the cell and click Edit Query to change your query. Copy the cell to copy the query. Refresh All refreshes all queries in the workbook. Select the target worksheet cell. Add an Account with the Account Wizard. Follow a similar process for other connectors. Five Steps to Easier Reporting! To avoid common errors and get the most out of Analytics Edge, I have prepared five more short videos for you, delivered daily to your inbox. Yes, I would like to receive 5 short emails from Analytics Edge. Start Excel, navigate to the Analytics Edge ribbon bar, and click the Register button. Each connector is a little different, but almost all require that you add an account before you can make a query. See the connector help documents for details. You can place queries on the same worksheet or different worksheets, and repeat as often as you need*. Change the data you download, the accounts you select, and even the connectors you use. Click Refresh All to re-run all your queries. * while Analytics Edge does not impose any restrictions on the number of queries you can make, Google, Facebook, Bing and other sources typically do. In normal usage, they should not be a problem. You can modify a query by simply selecting the cell and clicking Edit Query. The previous settings are automatically inserted into the wizard, and you can make changes easily. Click Finish to run and save your updated query. If the Edit Mode is ON, a comment will be placed in the cell as a reminder of the query location. While you are building your workbook, keep the Edit Mode ON. When you copy or move any of those cells (comments), the add-in will keep the queries in sync with the new cell locations. When you are finished with changes, turn the Edit Mode OFF. The Edit Mode can slow down Excel while it is on, especially in larger workbooks. Note: the comment contains a pointer to the query. With the Edit Mode ON, you can copy or move the comment within the same workbook and you will copy or move the query. You can add as many queries to your worksheet as you want. Click Refresh All to re-run all the queries in the workbook. They will refresh in order: top-to-bottom, left-to-right. If you want to copy/paste or move any of the queries, simply turn on the Edit Mode and copy or move the comments. If you want to copy or move the query to a different worksheet or workbook, the Edit Query button has a drop-down menu with Cut, Copy and Paste functions. To delete a query, use Edit Query > Cut. This entry was posted in A. E. Basic Add-in on 2018/06/03 by mike_sullivan.